Objectives: When maximum precision is required in performing periodontal surgery to satisfy particular esthetic demands, a surgical microscope that enhances complete visualization of the operative field may represent a useful tool. 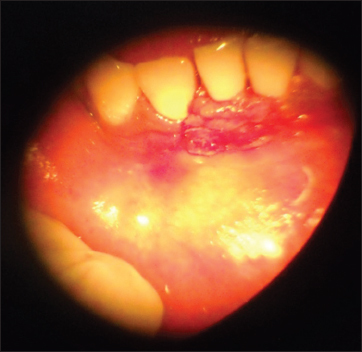 The aim of this case series was to assess clinical outcome of isolated gingival recession treated by using subepithelial connective tissue graft (SCTG) in combination with coronally positioned flap (CPF) in esthetic areas by using surgical microscope. Study Design: A total of 3 cases of isolated gingival recession (Class I and II) located on mandibular incisors were treated by using SCTG in combination with CPF with the aid of a surgical microscope. 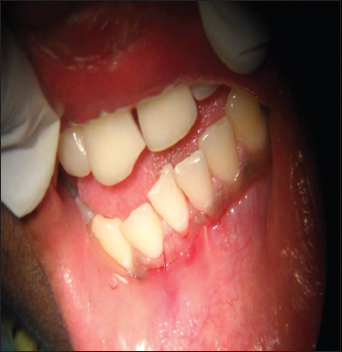 Gingival recession, probing pocket depth, clinical attachment loss, and width of keratinized gingiva were recorded at baseline, before surgery and at 6 months following surgery. 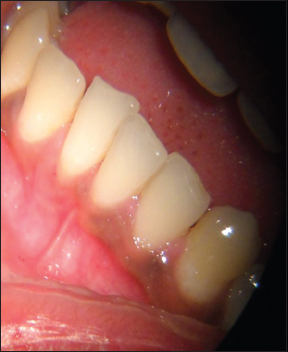 Results: Prior to surgery, there were 2 mm gingival recession (REC), 3 mm clinical attachment loss (CAL) with PPD of 1 mm in two cases while one case had 3 mm gingival recession, 4 mm clinical attachment loss with PPD of 1 mm. 6 months post surgery, 2 cases showed 2 mm reduction of gingival recession indicating 100% root coverage while one case showed 80% of root coverage (2 mm reduction of gingival recession). Conclusion: In the present case report, qualitative aesthetic evaluation of the treated cases showed better searing and marginal profile. This could be due to an atraumatic surgical approach and excellent visualization of the operative field by using surgical microscope. Microsurgery enhances normal vision through magnification and favorable lightening which would lead to an improvement in cosmetic results and patient comfort level. The treatment of gingival recession (GR) is a common request in daily periodontal practice mostly due to esthetic reasons. As esthetic represent an inseparable part of today's clinical practice, the surgical coverage of recession is mainly indicated for esthetic improvement rather than functional aspect. Recently, the esthetic perception of a stimulated root coverage procedure was explored in patients by Rotundo et al. and reported that complete root coverage was perceived as the most successful outcome by all treated patients. Several surgical procedures such as pedical flaps, free soft tissue graft, combination of pedical flaps and grafts or barrier membranes may be indicated to improve the coronal level to the gingival margin on the root surface.,,, A recent systematic review showed that coronally advanced flap (CAF) is a safe and predictable approach for root coverage and it is often associated with the complete coverage of the root surface. Furthermore, Connective tissue graft in conjunction with CAF enhances the probability to obtain complete root coverage and improve recession reduction in Miller Class I and II single GR. On the other hand, patient esthetic request has become more and more stringent. Root coverage procedures should provide not only the complete coverage of the recession defect but also soft tissue anatomy comparable to and indistinguishable from adjacent tissue. New technologies, instruments, and surgical techniques are therefore necessary to help clinician ensure the best results and satisfy the patient's expectation. In the last decade, the use of operative microscope was introduced in periodontal surgery to enhance visual perception and to illuminate the surgical field leading to improved flap incision and careful root debridement and suture., The purpose of this case series was to assess the clinical outcome of isolated GR treated using subepithelial connective tissue graft (SCTG) in combination with coronally positioned flap (CPF) in esthetic areas using a surgical microscope. A total of three patients (aged 21–22 years) complaining esthetic requirement due to isolated GR were selected from the outpatient Department of Periodontics, Sharad Pawar Dental College, Sawangi (Meghe), Wardha. The patients were included in the study using following criteria. Width of keratinized gingiva (WKG) apical to recession of ≥3 mm. Information concerning dietary status, systemic background, and mouth cleaning habits, gingival and periodontal status along with other routine clinical data were recorded in the specially designed chart. Patients were examined under good illumination with the help of mouth mirror, Tweezer, and Williams graduated probe and with pellets of cotton. Possible types of treatments and their associated risk and benefits were explained to the patients, and informed consent was signed by the each patient agreeing to the treatment. Every patient received initial therapy consisting of oral hygiene instructions, scaling and root planing, professional polishing with the use rubber cup and a low abrasive polishing paste. Coronoplasty was performed if needed. 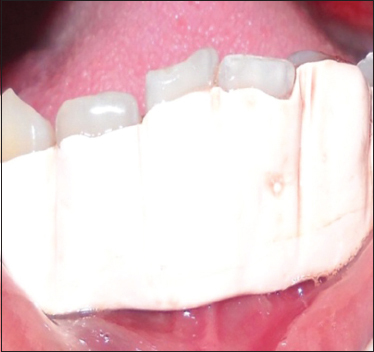 A coronally directed roll technique was prescribed for teeth with recession type defect to minimize tooth brushing trauma. Plaque control instructions were repeated until patients achieved a plaque score of equal or less than one. The patients' plaque control and tissue response were re-evaluated 6 weeks later. Before anesthesia, on the day of the surgical procedure, full-mouth plaque score were recorded using the plaque index (PI). 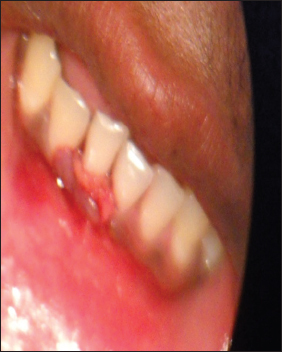 Gingival inflammation was assessed by papillary bleeding index (PBI). 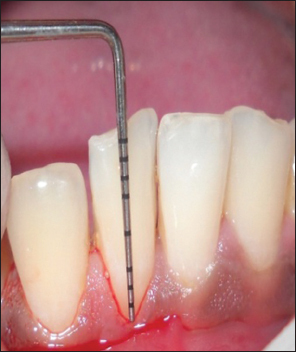 The probing pocket depth (PPD), clinical attachment level (CAL), GR, and WKG were measured on the midbuccal site of the tooth to be treated using a William's graduated periodontal probe (Hu-Friedy, USA). The cementoenamel junction (CEJ) was used as a fixed reference point. All the clinical measurements were recollected at 6-month follow-up [Table 1] and [Table 2]. After induction of local anesthesia (2% lidocaine, epinephrine 1:100,000) the exposed root surfaces was carefully planed with curettes and ultrasonic instruments. The root surface was not subjected to any chemical conditioning. Patients were treated by minimally invasive surgical techniques performed using SCTG in combination with CPF with the aid of surgical microscope. The microscope used had a fiber-optic illumination system, and the magnification varied between ×6 and ×40. Appropriate microsurgical instruments were used for the procedure; surgical blade, scissor, needle holders, and Ethicon 6.0 Vicryl absorbable sutures were used. 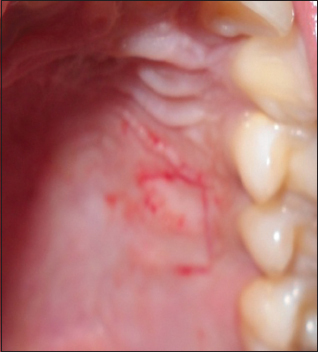 Intra-sulcular incision was made at the buccal aspect of the involved tooth. Two horizontal incisions were made at right angles to the adjacent interdental papillae, at the level of CEJ, without interfering with the gingival margin of the neighboring teeth. 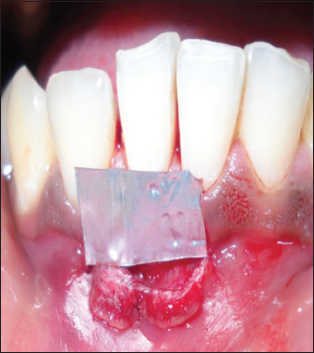 Two oblique vertical incisions were extended beyond the mucogingival junction, and a trapezoidal mucoperiosteal flap was raised up to the mucogingival junction. After this point, a split thickness flap was extended apically, releasing the tension and favoring the coronal positioning of the flap. The epithelium in the adjacent papillae was stripped away of its epithelium. Palatal tissue was harvested by a “trap door approach” from the area between the maxillary first molar and maxillary cuspid. An incision was made in the palate parallel to the maxillary premolar and first molar at a distance of approximately 3 mm apical to the gingival margin. Perpendicular incisions were then be made to establish width of the graft for covering the entire area of recession as well as the donor pedicle sites. A flap was reflected to expose the underlying connective tissue. The connective tissue graft was removed with a periosteal elevator. The graft was then placed on a sterile gauze pad and irrigated with saline. It was then modified as per the required dimensions after removal of excess fatty and glandular tissue. The primary flap was then returned to its original position and secured with a suture to obtain primary closure, using interrupted suturing technique. Following the reflection of the flap at the recipient site, the connective tissue graft obtained from the donor site was placed in position on the recipient site at the level of CEJ and secured with the interproximal papilla with suture. The flap was then coronally positioned to completely cover the connective tissue graft and de-epithelialized portions of the papillae. The coronal margin of the flap was placed slightly coronal to the CEJ and stabilized with the simple interrupted suture laterally and with continuous sling sutures coronally. Light pressure was applied to the area with saline – soaked gauze for approximately 2 min, to adapt the soft tissue wall to the tooth surface. Immediately after surgery, periodontal dressing was placed on the recipient site and the donor site. After surgery, a nonsteroidal anti-inflammatory drugs (ibugesic-ibuprofen + paracetamol B.D. for 5 days) was prescribed. No systemic antibiotics were utilized. Patients were instructed not to brush the teeth in the treated area. All patients were placed on 0.2% chlorhexidine gluconate twice daily, for 1 min, for 4–6 weeks. They were instructed not to disturb the pack and to avoid to disturb the pack and to avoid undue trauma to the treated site. One week following surgery, periodontal pack was removed. At this time, the healing was observed and a second periodontal pack was placed if necessary. After irrigation with saline, polishing was done with the help of polishing paste and rubber cusp, taking care that it did not traumatize the treated site. The patient was instructed to clean the treated site with cotton pellet saturated with 0.2% chlorhexidine gluconate for additional 3–4 weeks in an apico-coronal direction and later on using a soft toothbrush with Charter's method of brushing. The patients were recalled at 6 months following surgical treatment. At each recall visit, scaling and polishing were performed. Three male patients with the age of 21–22 years (mean 20.4 ± 6.5 years) associated with GR were treated using SCTG in combination with CPF with the aid of surgical microscope. Out of 3 patients two were having Class I GR defect, and one was having Class II GR defect. During the study, wound healing was uneventful. There was no postoperative complication in any patients, and all the patients were satisfied with the result. The mean plaque score at baseline was 1.00 and at 6 months postsurgery was 0.36. The mean PBI score was 0.98 and 6 months postsurgery was 0.30. There were a decrease in both mean PI score and mean PBI score 6-month postsurgery indicates effective plaque control and remained low (<1) during the study. Before surgery, there were 2 mm GR (REC), 3 mm clinical attachment loss (CAL) with PPD of 1 mm in two cases while one case had 3 mm GR, 4 mm clinical attachment loss with PPD of 1 mm. 6-month postsurgery, 2 cases showed 2 mm reduction of GR indicating 100% root coverage while one case showed 80% of root coverage (2 mm reduction of GR) [Figure 1], [Figure 2], [Figure 3], [Figure 4], [Figure 5], [Figure 6], [Figure 7], [Figure 8], [Figure 9], [Figure 10], [Figure 11]. The modern treatment goal in periodontal plastic surgery is the complete coverage of the recession defect providing soft tissue anatomy comparable to and indistinguishable from adjacent tissue., To achieve this goal, an accurate soft tissue management is essential in both surgical incision and suture. The aim of present case series study was to assess the clinical outcome of GR treated using SCTG in combination with CPF in esthetic areas using surgical microscope. Magnification systems as surgical microscope or loupes may be considered useful tools for the clinician to improve the handling of smaller instruments/blades in an illuminative surgical field. Previous studies have shown the utility of surgical microscope, to support regenerative procedure for deep infrabony defect  or access flap surgery for shallow to moderate infrabony defect. In this case series, three patients showing Miller's Class I and Class II GR defect were treated under surgical microscope. At 6-month follow-up, two cases showed 100% root coverage while one case showed 80% root coverage. Clinical outcomes observed in the present case series are similar to those reported in a comparative trial for the treatment of GR defect using microsurgical approach. The present findings are also supported by other clinical studies concerning the advantage of microsurgery. 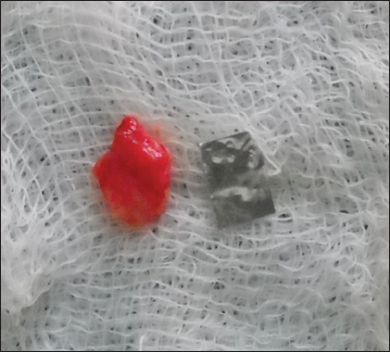 Burkhardt and Lang  in their clinical report demonstrated the advantages of the microsurgical approach in treating root coverage by free connective tissue graft. They found faster healing and vascularization in microsurgically treated sites comparable to those receiving conventional care. Clinical outcomes showed higher efficacy of microsurgery approach than macrosurgery (98% vs. 90% of mean root coverage). Therefore, it seems reasonably to state that surgical microscope with the specially designed instruments may aid incision/surgical manipulation of soft tissue for root coverage procedure, thus leading to better esthetic outcome after healing. To achieve an excellent result in terms of both esthetics and function, it is fundamental to perform extremely fine and accurate incisions, meticulous suturing to promote stabilization and immobilization of the graft, and precise closure of wound margins. Magnification of the structure, together with proper lightening improves recognition of tissue element and may facilitate these operative procedures. The use of optical magnification permits refinement of surgical techniques; consequently, the potential for clinical success can be improved. The latter is dependent on a surgically atraumatic approach, which is limited by the surgeon's skill and the perception of the human eye.,, Periodontal microsurgery, when performed by a skilled surgeon after adequate training, may represent an effective means of improving the outcome of the procedures used to treat GR and, more generally, of periodontal regeneration, providing at the same time less operative trauma and discomfort., The possibility offered by a surgical microscope to modify magnification and illumination allows accurate dissection and gentle manipulation of the tissues and placement of extremely accurate sutures, enhancing the healing potential of the treated sites. These results may justify the interest in the application of the surgical microscope, and of magnification in general, to the field of periodontology. The microscope, used by a highly skilled surgeon, may represent a helpful tool for periodontists dealing with modern periodontal surgery as well as esthetic dentistry. High magnification and proper instrumentation, although allowing greater precision during surgical procedures, cannot by themselves eliminate all possible causes of failure related to mucogingival treatment. Sometimes, failures are completely unrelated to either the surgeon's ability or techniques used. The failures may simply be related to the patient's lack of compliance postsurgically or other unpredictable events, irrespective of the use of microscope. Clinical outcomes of these case series study suggest that surgical microscope may be a useful tool in periodontal plastic surgery. Bouchard P, Malet J, Borghetti A. Decision-making in aesthetics: Root coverage revisited. Periodontol 2000 2001;27:97-120. Rotundo R, Nieri M, Mori M, Clauser C, Prato GP. Aesthetic perception after root coverage procedure. J Clin Periodontol 2008;35:705-12. Roccuzzo M, Bunino M, Needleman I, Sanz M. Periodontal plastic surgery for treatment of localized gingival recessions: A systematic review. J Clin Periodontol 2002;29 Suppl 3:178-94. Clauser C, Nieri M, Franceschi D, Pagliaro U, Pini-Prato G. Evidence-based mucogingival therapy. Part 2: Ordinary and individual patient data meta-analyses of surgical treatment of recession using complete root coverage as the outcome variable. J Periodontol 2003;74:741-56. Oates TW, Robinson M, Gunsolley JC. Surgical therapies for the treatment of gingival recession. A systematic review. Ann Periodontol 2003;8:303-20. Cairo F, Pagliaro U, Nieri M. Treatment of gingival recession with coronally advanced flap procedures: A systematic review. J Clin Periodontol 2008;35 8 Suppl: 136-62. Burkhardt R, Lang NP. 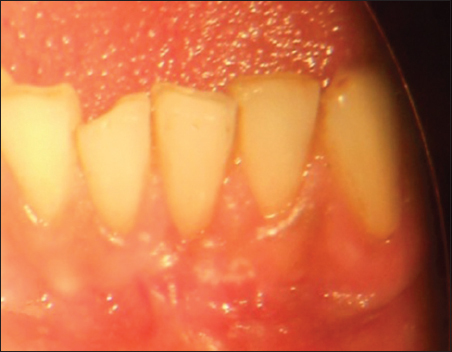 Coverage of localized gingival recessions: Comparison of micro-and macrosurgical techniques. J Clin Periodontol 2005;32:287-93. Cairo F, Carnevale G, Billi M, Prato GP. Fiber retention and papilla preservation technique in the treatment of infrabony defects: A microsurgical approach. Int J Periodontics Restorative Dent 2008;28:257-63. Turesky S, Gilmore ND, Glickman I. Reduced plaque formation by the chloromethyl analogue of victamine C. J Periodontol 1970;41:41-3. Mühlemann HR. Psychological and chemical mediators of gingival health. Rev Odontostomatol (Paris) 1977;6:352-7. Cairo F, Rotundo R, Miller PD, Pini Prato GP. Root coverage esthetic score: A system to evaluate the esthetic outcome of the treatment of gingival recession through evaluation of clinical cases. J Periodontol 2009;80:705-10. Cortellini P, Tonetti MS. Microsurgical approach to periodontal regeneration. Initial evaluation in a case cohort. J Periodontol 2001;72:559-69. Francetti L, Del Fabbro M, Calace S, Testori T, Weinstein RL. 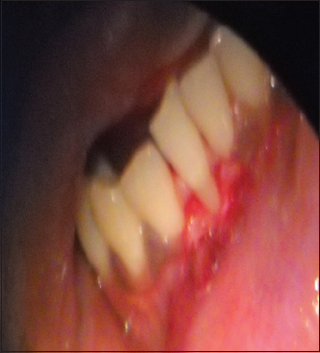 Microsurgical treatment of gingival recession: A controlled clinical study. Int J Periodontics Restorative Dent 2005;25:181-8. Camargo PM, Melnick PR, Kenney EB. The use of free gingival grafts for aesthetic purposes. Periodontol 2000 2001;27:72-96. Belcher JM. A perspective on periodontal microsurgery. Int J Periodontics Restorative Dent 2001;21:191-6. Michaelides PL. Use of the operating microscope in dentistry. J Calif Dent Assoc 1996;24:45-50. Burkhardt R, Hürzeler MB. Utilization of the surgical microscope for advanced plastic periodontal surgery. Pract Periodontics Aesthet Dent 2000;12:171-80.